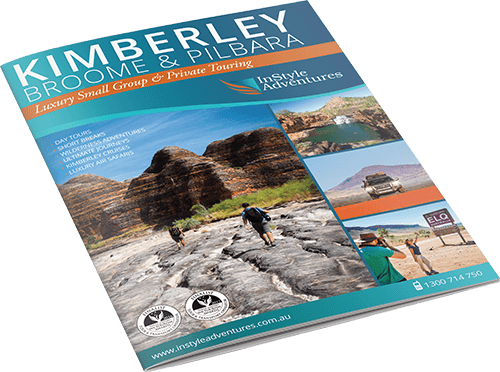 We are pleased to offer a range of quite different day tours from Broome for experiencing this incredible natural site on the Kimberley Coast. Described by David Attenborough as “Australia’s most unusual natural wonder”, Horizontal Falls is a natural phenomenon that is as intriguing as it is stunning. In the turquoise water of Talbot Bay, the fast moving tidal current squeezes through two narrow gorges of the McLarty Range, pushing the water into rapid like formations which rush through the twin gaps at an astonishing rate, producing waterfalls turned on their side. The powerful tides in the Kimberley can reach more than 10 metres and the direction of the flow reverses ensuring the water flows two different ways each day. Located in the Buccaneer Archipelago this unique waterfall is not accessible by vehicle. You can view the Horizontal Falls from the air with a scenic flight from Broome or Derby all year round. 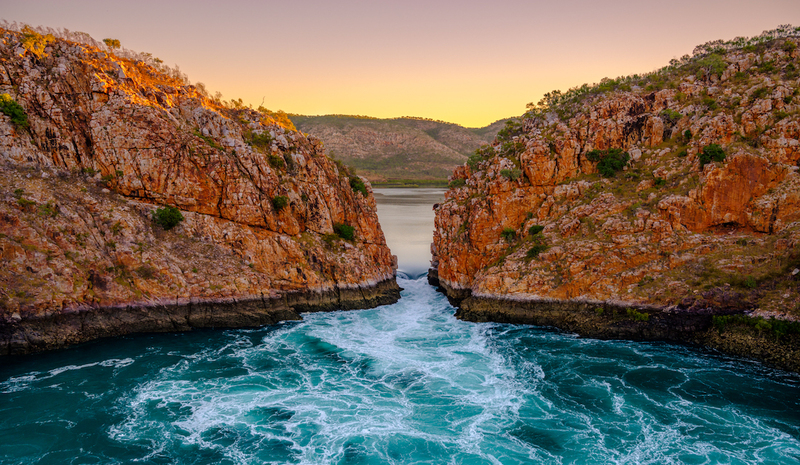 Get up close with an extended cruise or visit by float plane and land at the Horizontal Falls and hold on tight as you take a thrilling boat ride through the rushing water torrents. This area is part of the Lalang-garram/Horizontal Falls Marine Park, created in 2016 as part of the Kimberley Science and Conservation Strategy. Let us know which one you prefer and we can book you in. After a 05.30am courtesy bus pickup from your accommodation, board a custom built 4×4 and travel deep into the heart of the Kimberley.The first stop is the famous pearl shell church at Beagle Bay followed by a tea or coffee break. 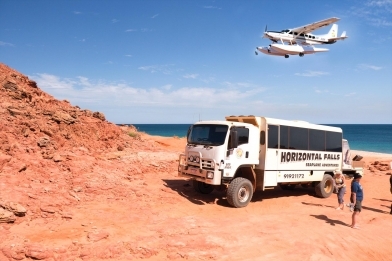 Then travel to Kooljaman at Cape Leveque for breakfast and a tour of the area’s stunning, unspoilt beaches. A short distance away visit One Arm Point community for an informative tour of their innovative aquaculture hatchery. All aboard a 14 seater luxury seaplane for a scenic low level flight over the thousand islands of the romantic Buccaneer Archipelago. Experience a spectacular seaplane landing at Talbot Bay. Enjoy a fresh BBQ barramundi lunch served by the chef on board the luxury house boat. 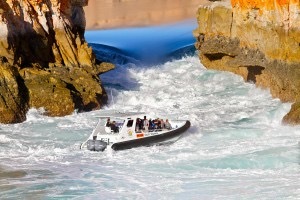 It’s time to get the heart rate up again, with a ride through the Horizontal Falls on our 900hp fast boat. Sit back and relax as you cruise through the spectacular untouched surrounding bays and creeks. Experience the thrill of swimming in our huge croc/shark free cage and feeding or friendly fish. Fly direct back to Broome with an aerial view of Cable Beach and Broome township prior to landing. *Tour also operates in the reverse direction. Join a 14 seater luxury seaplane for a scenic low level flight over the thousand islands of the romantic Buccaneer Archipelago. Experience a spectacular seaplane landing at Talbot Bay. Enjoy a fresh Breakfast or BBQ barramundi lunch served by the chef on board the luxury house boat. 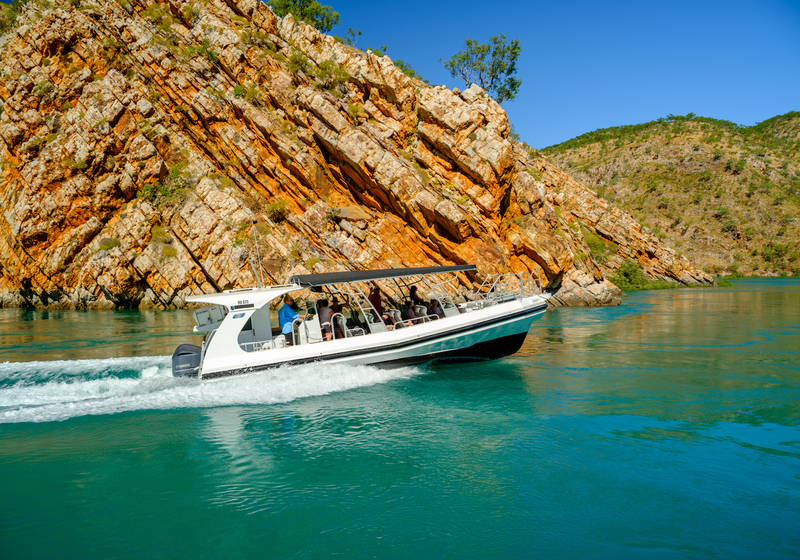 It’s time to get the heart rate up again, with a ride through the Horizontal Falls on our 900hp fast boat. Sit back and relax as you cruise through the spectacular untouched surrounding bays and creeks. Experience the thrill of swimming in our huge croc/shark free cage and feeding or friendly fish. Fly direct back to Broome with an aerial view of Cable Beach and Broome township prior to landing. The full-day tour features scenic flights and a fast boat cruise that take you deep into the heart of the wild Kimberley. The adventure begins with a scenic flight north-east over Cape Leveque and the Buccaneer Archipelago landing on the red dirt airstrip at Cockatoo Island. Then it’s all aboard the fast boats for a guided Kimberley cruise through Yampi Sound to Talbot Bay, including the Horizontal Falls. Returning to Cockatoo Island for the final flight low across the Horizontal Falls and onto Broome for an aerial perspective of your day in the Kimberley.